A good facial steaming session, as you might have already discovered, works wonders! It unblocks pores, removes impurities, and gives your skin a healthy glow. We understand if you want to have access to this good stuff any time of the day and any day of the week. 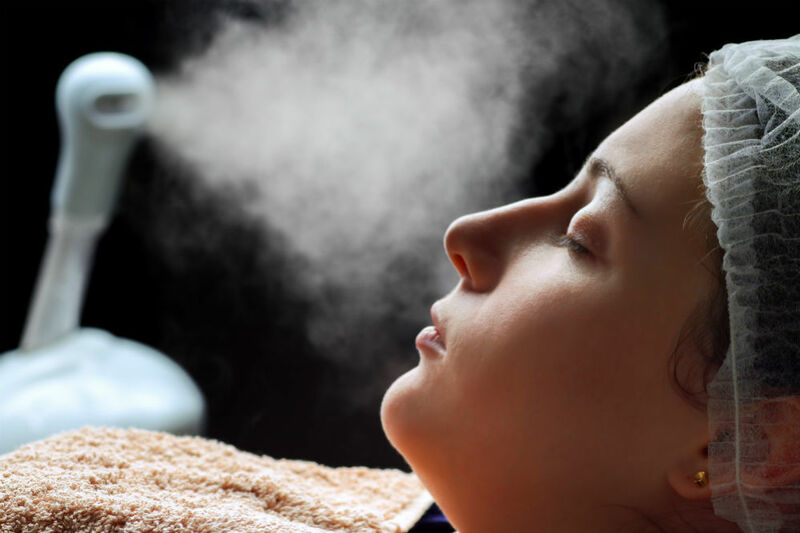 And this article will help make it possible for you for we are going to look at the best facial steamers for home use today. This white and gold facial steamer is equipped with a PTC Ceramic Heating Element and a Nano-Atomization Technology that generates a strong 104-degree Fahrenheit nano-ionic steam in seconds! It is designed with UV light to sterilize the steam and a precision control knob that allows you to adjust humidity. Additionally, it is fitted with a 70-milliliter water tank that buys you 12 minutes of runtime. The ECVISION Nano Ionic Facial Steamer comes with five different complimentary blemish extractors for pimples, acne, blackheads, and whiteheads. The package includes a user manual and blackhead tools kit. Its larger water reservoir provides for a 12-minute steaming time, which is longer compared to the 8-minute steaming of other steamers. The nano-ionic steam is said to be 10x more effective in penetrating the skin. The ECVISION Nano Ionic Facial Steamer works for all skin types. It comes with a 90-day money-back guarantee and one year warranty. While its water reservoir is already bigger than most facial steamers’, it certainly can still use more water storage capacity for longer runtime. This 3-in-1 white and blue device is used as a nano steamer, humidifier, and towel warmer. A simple turn of a knob helps you set it to your chosen setting. This multi-functional device combines the heating element of conventional facial steamers and the capability to release negatively charged ionic particles of ultrasonic vaporizers. It is equipped with a 200-milliliter water tank that affords you up to 30 minutes of steaming time. Plus, it operates silently. The Pure Daily Care 3-in-1 Nano Steamer comes with a 5-piece kit of surgical-grade stainless steel blemish extractors; eye hole, angled, needle, oval, and flat wire extractors. You should also find a complimentary pouring cup, power cord, and user manual in the package. It measures 10 x 6 x 6 inches and weighs 2.5 pounds. Besides pore cleaning, it does a great job in clearing the air passages. The surgical-grade set of blemish extractors makes a nice addition. It would have been great if the steam direction can be repositioned or tilted so that you can do your facial steaming not only directly above it but also in front of the device. If you’re looking to use the towel warmer feature, you can only use it for small washcloths. This purple and white beauty tool features a two-in-one function. It works as a facial steamer as well as an essential oil vaporizer. Its front knob lets you adjust the steam on two levels. This versatile device is designed with an advanced PTC ceramic heating element to produce strong steam of negatively charged ionic particles in seconds. It can load up to 50ml of water which will fetch you eight to ten minutes of runtime. The Beauty Nymph Facial Steamer comes with a complimentary measuring cup, nose and mouth inhaler attachment, full face extension, and a user manual. It measures 5.5 x 10.6 inches and weighs one pound. This facial steamer allows you to choose between a low and a high steam level. It works great for both nasal decongestion and pore cleaning. The full face extension helps keep the steam in one area. This tool doesn’t come with a timer, so you have to shut it off manually. The 50ml water only allows eight to ten minutes of steaming time, which doesn’t take long compared to other devices. Hence, the water storage capacity is a bit wanting. You need to wait two minutes for it to start producing good steam. The ECVISION Nano Ionic Facial Steamer and the Pure Daily Care Nano Steamer have the same vase-like structure and the metallic color on the mouth down to the control knob in front. The water tanks of both models are positioned at the back, so refilling is possible while the facial steamer is still in use. They release steam in a scattered fashion as well. On the other hand, the Beauty Nymph Facial Steamer comes with a full face extension that gathers the warm mist in a smaller area, eliminating the need to make a ‘tent’ over your head to gather the steam. The three devices come in different water tank capacities. Pure Daily Care Nano Steamer can hold up to 200ml; ECVISION Nano Ionic Facial Steamer, 70ml; and the Beauty Nymph Facial Steamer, 50ml. This then translates to different runtimes. Pure Daily Care Nano Steamer can do up to 30 minutes of steaming in one load; ECVISION Nano Ionic Facial Steamer, 12 minutes; and the Beauty Nymph Facial Steamer, eight to ten minutes. Aside from runtime, you would also want to consider the speed with which these facial steamers produce heat. While the nano-atomization technology of the ECVISION and Pure Daily Care nano steamers allows it to produce steam in seconds, you might have to be more patient with the Beauty Nymph Facial Steamer that takes around two minutes to produce a warm mist. The multi-functional Pure Daily Care Nano Steamer comes out the priciest among the three. ECVISION Nano Ionic Facial Steamer and Beauty Nymph Facial Steamer place second and third, respectively. The best facial steamer for you will depend on your needs and lifestyle. Cost should not be much of an issue here since there are not much price gaps among the three products. Also, as you pay for a few more dollars, you get more water tank capacity and runtime. So are you going to use it solely as a facial steamer or would you also like to use it as an air humidifier? The more your answer leans towards the former, the more compatible you are with the Beauty Nymph Facial Steamer. The more your preference leans towards the latter; the more suitable the Pure Daily Care Nano Steamer is for you. And if you want more of the facial steamer functionality but less than the waiting time in the Beauty Nymph model, the ECVISION Nano Ionic Facial Steamer is perfect. I think any kind of artificial remedy for facial term effect badly your skin. So if you can use natural element, it’s may be better, like turmeric, milk and so on.